Register here (deadline for registration: 16 April 2019). How to write a competitive proposal for Horizon 2020? How to build a strong EU consortium? 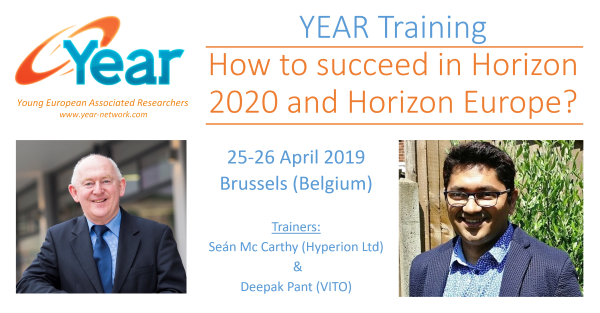 In addition, the YEAR training is the perfect opportunity to network with other like-minded young researchers from other European research institutes. More detailed information about the course content is available in the preliminary programme. The YEAR Training is exclusively reserved for our YEAR member institutes and the training fee is fully covered by YEAR. Researchers with 1 to 10 years of experience in research from all research fields, willing to be proactive in writing successful EU proposals. The training will take place at the SINTEF Brussels Office (9 rue Guimard, Brussels, Belgium), right in the middle of the European area. We recommend to stay in the following hotel: Motel One. Interested? The registration is now open. For more information, contact Alexis Sevault or the YEAR Board representative at your institution. Looking forward to seeing you at the YEAR Training in April!